An evolutionary step in Infrared (IR) windows, the Platinum Series VPT utilizes IRISS exclusive technology to allow the use of any thermography camera to monitor electrical equipment. The polymer enables viewing in the visual, UV and shortwave, midwave, and longwave IR spectrums. IRISS IR windows are durable and fully impact resistant per UL and IEEE standards. The patented, reinforced grill exceeds high voltage switchgear viewing pane standards and is manufactured from non-conductive UL 94 plastics insulated to 30kV/mm. The pharmaceutical-grade grill complies with IP2x standards for safe maximum hole size in switchgear to prevent accidental insertion of body parts. IRISS unconditionally guarantees against transmission loss ensuring accurate qualitative and quantitative analysis. IRISS IR windows are available with an Easy-Grip stainless steel cover. This lockable cover maintains IP65/NEMA 4 seal when closed. 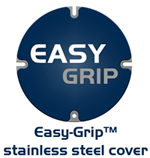 Easy-Grip covers also allows for private labeling. Original equipment manufacturers, aftermarket customers, and private contractor can display their company logo and contact information. IRISS manufacturers and assembles all products at their global headquarters located in Bradenton, Florida. IRISS polyer optics do not degrade when exposed to acids, alkalis, UV, moisture, humidity, vibration, and high frequency noise - a guarantee no crystal IR window can provide.